Check out our new retail displays! This displays offer a full 360 degree viewing area to display your brand or product. You can also connect and use the document holders to give more information on what you need to advertise. We offer a quick turn around on this product to help you get your next event, updated and looking great. 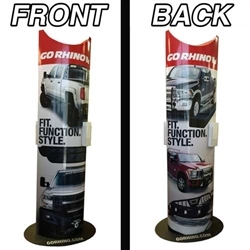 Use this to advertise your services at your next trade show or on your retail floor. Call us to help you get this order set up and get this great looking display in your hands!